BEIJING — China’s new value-added tax (VAT) reform measures are expected to reduce the burden on a range of sectors in the real economy, analysts said. China will cut VAT rates as part of a tax reduction package amounting to 400 billion yuan (about $63.6 billion) this year, according to a decision made at a State Council executive meeting on March 28. Starting from May 1, the tax rate will be lowered from 17 percent to 16 percent for manufacturing and some other industries, and from 11 percent to 10 percent for transportation, construction, basic telecommunication services, and farm produce. While it will be only a one percentage point cut in each tax bracket, the reduction will impact a wide range of sectors in the real economy, according to Li Xuhong, a researcher with Beijing National Accounting Institute, a government think tank. It was estimated that the reduction of taxes from lower VAT rates could reach 240 billion yuan. Li said the estimate was rather conservative, as tax reduction in the manufacturing sector alone could reach that amount. VAT tax cuts in the transportation industry will lower the logistics costs for the real economy, Li said. Investment bank China International Capital Corporation (CICC) estimated that firms in the two tax brackets will see their VAT tax burden decline by 6 percent and 9 percent, respectively. “We believe that lower VAT rates will help reduce the prices of products and services in a number of competitive sectors, benefiting households and other sectors,” CICC said in a research note. In addition to the VAT rates cut, the reform also offers tax incentives for some high-tech companies, a measure that analysts said is aimed at supporting innovation-driven growth. Eligible enterprises in advanced manufacturing, modern services, and electric utilities will receive a lump-sum refund for their input VAT payments yet to be deducted. The measure will have a “far-reaching impact,” said Li, as it could free capital previously frozen on companies’ balance sheets. However, successful implementation of the refund policy depends on advanced tax collection measures and the overall level of honesty of taxpayers across society, Li noted. The reform also includes measures to unify the standard for small-scale taxpayers, as it raises the threshold of taxable annual sales volume for industrial and commercial enterprises from 500,000 yuan and 800,000 yuan, to 5 million yuan. “Raising the revenue ceiling to 5 million yuan for industrial and commercial sectors will help level the playing field and support the growth of medium and small firms in all sectors,” CICC said. With all these measures, this year’s VAT reform is more intensive than last year, CICC said. The VAT reform was first piloted in Shanghai before it was rolled out nationwide. 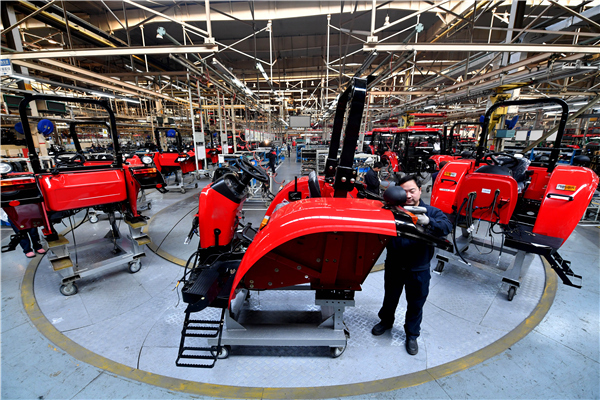 It has delivered a total tax cut of 2.1 trillion yuan over the past five years. “We expect the reform to support China’s economic growth in not only second quarter of 2018, but also the whole year and the first four months of 2019,” CICC said. For Li, a more challenging job yet to be accomplished is to further reduce VAT brackets from three to two. In 2017, China streamlined its VAT brackets from four to three. China aims to reduce taxes on businesses and individuals by more than 800 billion yuan this year, according to a government work report released in March. While the VAT reform will help accomplish almost half of the target, policies to cut the remaining 400 billion yuan of taxes will be released soon, said Wang Jianfan, an official with the Ministry of Finance.